Ecuador, 1926, 1r Yellow Buff, Blue Ruled Paper, Reprint, left margin block of 20, without gum as issued, full margins, Very Fine. Scott No. 4R Estimate $100 - 150. Ecuador, 1865, 1r Orange, full manuscript "Zozoranga" cancel of Loja province, full margins, Very Fine and choice, extremely rare with only this stamp and one cover recorded, ex-Saá. Scott No. 4 Estimate $300 - 400. 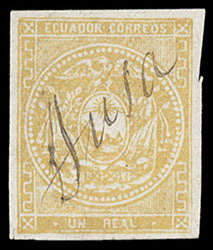 Ecuador, 1865, 1r Yellow, full manuscript "Tusa" cancel, full margins, Very Fine and choice, the only known example of this manuscript cancel, ex-Saá. 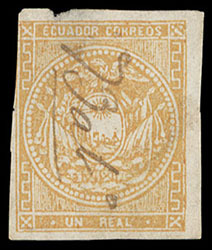 Ecuador, 1865, 1r Yellow, manuscript "Babo" cancel of Babahoyo (De Los Rios province), couple thins, F.-V.F. appearance, about five examples known. Scott No. 4 Estimate $100 - 150. 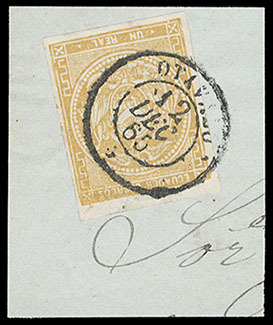 Ecuador, 1865, 1r Yellow, cancel group of 4 singles; includes manuscript "Riobba" of Riobamba, red Jipijapa circular handstamp (without date type), 1865 Otavalo circular townmark on piece, and portion of Portoviejo circular townmark with matching dotted lozenge, F.-V.F. 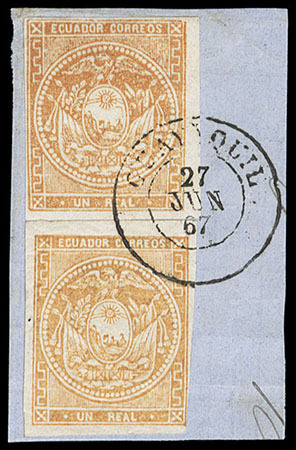 Ecuador, 1865, 1r Orange, two singles, bottom stamp position 47 showing top frameline missing, tied by "Guayaquil, 27, Jun, 67" cds on piece, Very Fine. Scott No. 4 Estimate $50 - 75. 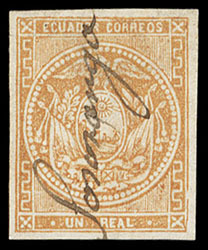 Ecuador, 1865, 1r Orange Ochre, Horizontal Pair, positions 71-72 showing colorless line through "REAL" in position 71, clear to large margins, in combination with 1866, 4r red on piece tied by 1867 Guayaquil cds's, Very Fine, a very scarce 1r first period combination, ex-Olgieser. Scott No. 4+6 Estimate $300 - 400. Ecuador, 1865, 1r Orange, in combination with 1865, ½r blue slightly overlapping on piece tied by 1867 Ambato town cancel, Very Fine. Scott No. 4+2 Estimate $75 - 100. 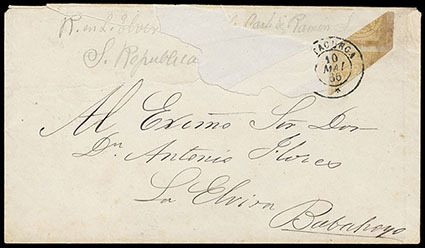 Ecuador, 1865, 1r Yellow Buff, Double Bisect, integral lower right and upper left portions of stamps on cover addressed to Antonio Flores in Babahoyo, tied by "Latacunga, 10 Mai, 66" cds; cover with tears with portion of top center missing, Fine, ex-Ayora and Olgieser; with A.F.E. certificate. Scott No. 4c Estimate $4,000 - 6,000. THE ONLY EXAMPLE OF A DOUBLE BISECT USAGE FOR ANY ADHESIVE IN THE FIRST ISSUE. Antonio Flores became President of the Republic from 1888 to 1892. 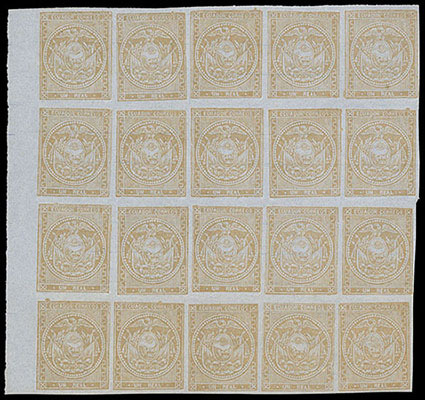 Ecuador, 1865, 1r Chrome Cinnamon, Rejoined Block of Ten and Single, block in at bottom and separated between the second and third horizontal row (block of four and six), all cancelled and tied by dotted lozenges and "Latacunga, 24 Mai, 66" cds's on Judicial wrapper to Riobamba, manuscript "22 oz" weight notation at top center, Very Fine, the largest recorded multiple usage featuring the chrome cinnamon shade, ex-Wolmer and Olgieser. Scott No. 4 Estimate $2,500 - 3,500.